Presenting Percy might not have taken the traditional route to the RSA Insurance Novices' Chase but it made no difference as he bolted up at Cheltenham. Davy Russell switched his mount off at the rear of the field and when he decided to join in towards the end of the back straight, he was absolutely cruising. Winning jockey Russell said: "I've underestimated this horse all along. "I've nothing but praise for the man (Kelly), he's a genius.We'll enjoy today." Reynolds went on: "I'm speechless. I'm just delighted he's shown what he can do - I knew he was a Graded horse. "It was the hardest four or five minutes I've ever put in. It's been incredible. "I think Pat deserves all the credit for the route he has taken with the horse. He got a bit of a slagging about the route he had taken, but he's taken him out of novice company twice and I think it's toughened him up. "The man is an absolute genius. How he hasn't got a yard full of horses is beyond me. "To have a horse good enough to come to Cheltenham is incredible, but to have a horse to run the way he's done is unbelievable." Asked whether he felt Presenting Percy could develop into a Gold Cup contender, he said: "I'm just delighted to win the RSA. Today is just amazing." Henry de Bromhead said of Monalee: "He ran a blinder and I'm delighted with the run but I am disappointed not to win but such is life. He is galloping all the way to the line, he is definitely a three-mile horse. They are two very good novices and he was just beaten by a better one on the day. "I hope so in time that he could be a Gold Cup horse but that is a long way away, but it is the kind of direction we would be hoping to go. He handles most ground but possibly better ground might suit. 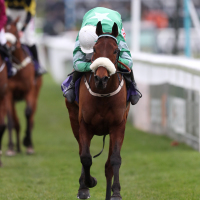 Hopefully we will see him at Punchestown." Colin Tizzard said of Elegant Escape: "He is a good strong stayer. Just when they crowded round him a bit they had a bit too much pace for him. He was staying on strong from the last and he will make a lovely Ladbrokes Trophy and Welsh National horse."